It’s fall, and that means leaves falling, pumpkin pie baking, calendars rapidly filling, and ….. contrails forming. So what exactly is a contrail? Contrails (short for condensation trail) are man-made “clouds” created by aircraft engines when the temperature and humidity conditions are just right. Usually occurring at temperatures below -40°C, and at altitudes above 26,000 ft, contrails are formed when water vapor condenses and then freezes on the particulate matter in aircraft exhaust. To form a contrail, the temperature must be low enough or the humidity must be high enough for water to condense on the exhaust particles. Since the process of condensation is well understood, it is possible to predict when contrails will form based on prevalent temperature and humidity conditions. Typically, with fall weather comes cool, moist air aloft and conditions at are perfect for contrail production. Think about it: do you see very many contrails in the summer months when it is hot and dry? Sometimes contrails dissipate rapidly with high winds or high turbulence aloft, and sometimes contrails linger for quite some time. Contrails dissipate rapidly with low humidity, since the newly formed ice crystals evaporate quickly. With high humidity, persistent contrails are visible, as ice crystals grow in size, absorbing water from the surrounding (humid) atmosphere. You might see a contrail which has been stationary for some time right next to one which is dissipating rapidly. These contrails are at different altitudes, with different conditions at each level. Since different gas composition, exhaust gas temperatures, and water vapor content exist in different aircraft engines, not all aircraft engines will produce a contrail at the same altitude (with identical weather conditions) at the same time. Contrail formation has nothing to do with the type of aircraft or its speed. Another form of contrail is produced when a portion of an aircraft such as a wingtip or winglet causes air cavitation in humid conditions. Have you ever seen these vapor trails, perhaps at an airshow, when aircraft flying low over the airfield pitch up rapidly in high humidity conditions? And since we’re mentioning winglets (shown below), you might be interested to know why they’re on the wing. The winglet serves to reduce aerodynamic drag so the aircraft burns less fuel in flight. This fuel efficiency is created by breaking up the turbulent wingtip vortices (pronounced VOR-ti-sees) produced by the pressure differential between the bottom and top of the wing. No vortices = less drag. 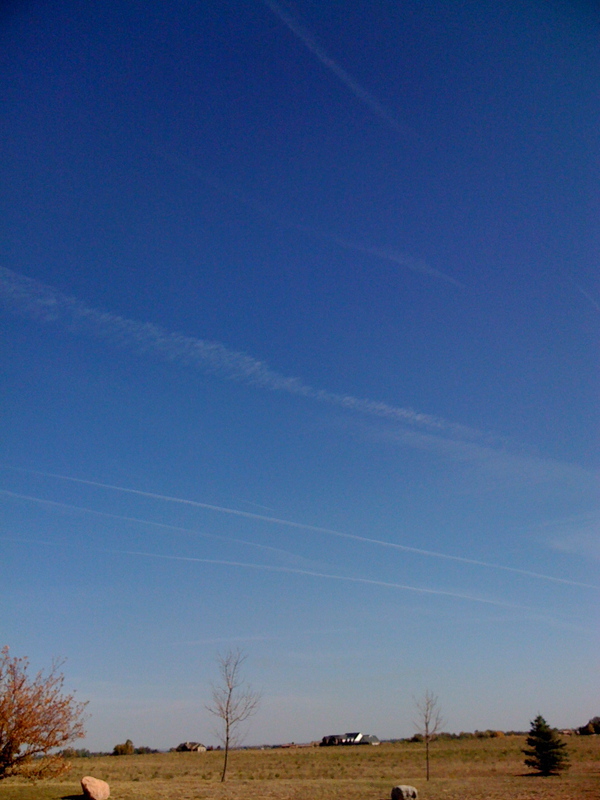 Back to the contrails, though… have you ever seen patterns in the sky produced by contrails? Perhaps all paralleling one another or converging on a point? 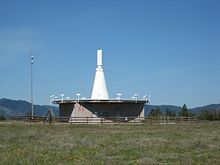 The aircraft whose contrails you see are each navigating with navaids similar to the one shown above. Therefore the aircraft fly over the navaids as they transit the jet routes. Parallel tracks of contrails are aircraft flying along the same route. If you are ever curious about a contrail track you observe, you can check http://flightaware.com. A screen shot near Dallas, Texas shows multiple aircraft tracks transiting along an east-west jet route using navaids. 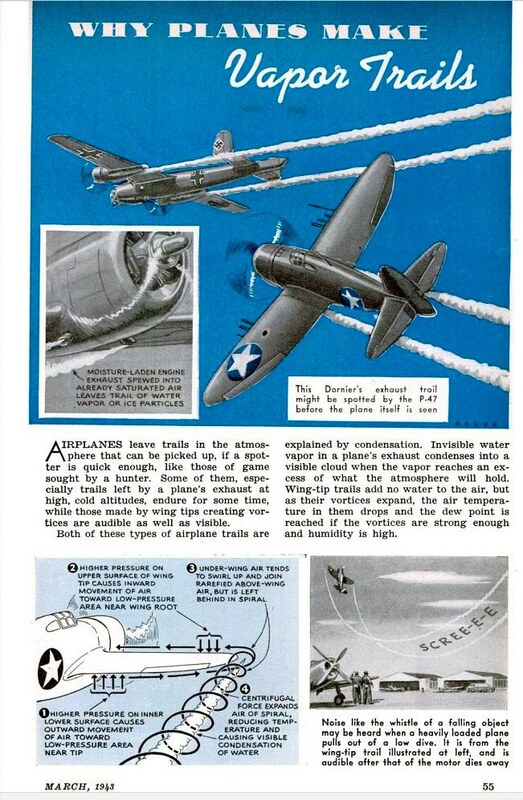 …”Military planners have been interested in condensation trail (contrail) forecasts since World War II. Contrails can make any aircraft easy to locate by enemy forces, and no amount of modern stealth technology can hide an aircraft if it leaves a persistent contrail in its wake. In 1953, a scientist named H. Appleman published a chart that can be used to determine when a jet airplane would or would not produce a contrail. For many years, the US Air Force Global Weather Center used a similar chart to make contrail forecasts. The first published reports of contrail formation appeared shortly after World War I. At first, scientists were not sure how contrails formed. We now know that they are a type of mixing cloud, similar to the cloud that sometimes forms from your breath during a cold winter day. Appleman showed that when the air outside of the airplane is cold enough and moist enough, the mixture of the jet exhaust and the air would form a cloud. An example of a contrail-forecasting chart is shown below. We will use the chart to make our own forecasts, and make observations to determine whether they are true or false. … Using either the temperature information provided by the teacher or the temperatures obtained from an Internet location (see note below), complete the table on the “Student Data Sheet”, then plot the temperatures corresponding to each pressure level on the “Appleman Chart: Student Graph Worksheet”. Connect the points to create a temperature profile of the atmosphere. This activity would make a perfect accompaniment to a physical science class, a weather unit study, or just a fun diversion. If you have a weather station in your home, it would pair up nicely as an associated activity. For younger elementary students, the NASA site also has a word search and a downloadable “Clouds and Contrails” craft. Have fun!